Spectral purity is the key contribution of the Agilent 8662A. Typical absolute phase noise performance of this generator at a 1 kHz offset is as low as -135 dBc/Hz, depending on the band of operation. The frequency range of the Agilent HP 8662A is 10 kHz to 1280 MHz. It offers versatile AM/FM, using either internal 400 Hz and 1 kHz rates or externally applied modulating signals. 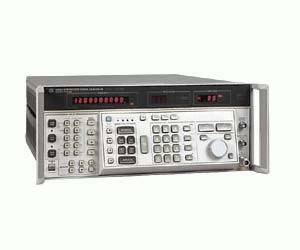 The Agilent HP 8662A signal generator, is ideal for many radar, satellite communication, and phase noise measurement applications with a Range of 10kHz to 1280MHz. Option 1 -Rear Panel RF Output and Modulaton Input .